This is the second Paul John dram in the calendar so far. 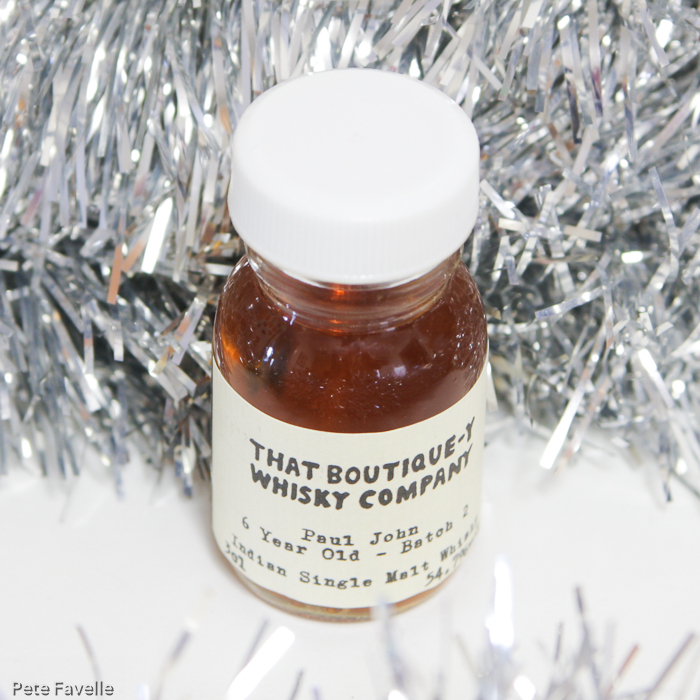 This second batch has an added age statement and it’s worth pointing out that although 6 years sounds young for a premium whisky, spirits aged in warmer climates tend to age impressively quickly. Paul John 6 Year Old Batch 2 is a deep golden dram, bottled at 54.7% ABV. The nose is full of dark spiced honey, brandy soaked raisins and a smouldering wood fire. Water brings out much more peat and old oak barrels. In the mouth, it’s sweet and spicy; vanilla caramel and plenty of alcohol warmth. Hints of sweet red strawberries appear over time, and a lingering peppery finish. Watered, it’s still filled with red fruit syrup and a warming bonfire in the finish The spice is tamed, and the caramel takes on a much lighter character. With or without water this is a fabulous dram – another magnificent 4.5 stars from Paul John!